Summary. Schotia brachypetala flowers in spring and early summer and produces copious nectar that attracts numerous specialist and opportunistic nectar-feeding bird species. 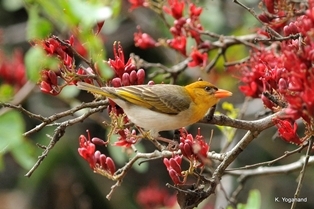 Twenty-eight bird species were observed feeding on the nectar of two flowering trees, one in Limpopo province and another in Gauteng province, both in South Africa, during Septemberâ€“October 2011. Together with our observations, a literature search and additional reports from other observers brings the total number of bird species recorded feeding on S. brachypetala to 54 species. This note further emphasises the diversity of generalist or opportunistic nectarivores in southern Africa. Literature references are also provided for some of the above species. Photos kindly provided by K Yoganand. More photos may be seen in the paper. 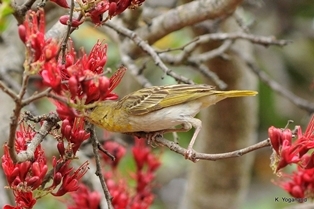 Read more about Village Weaver, a key generalist avian pollinator of African plants, here.